Finding a quality tool to clean your floors can be difficult enough on its own, but finding one that will let you clean your stairs can be even more so. That’s why you want to look for the best stair vacuum cleaners out there. Luckily for you, we’ve found what we think are the ten best options for you to choose from in our stair vacuum buying guide. Type: There are a number of different types of vacuums but when it comes to stair cleaners you’re going to want to look at stick versus handheld options. We’ll let you know all about what these choices offer. 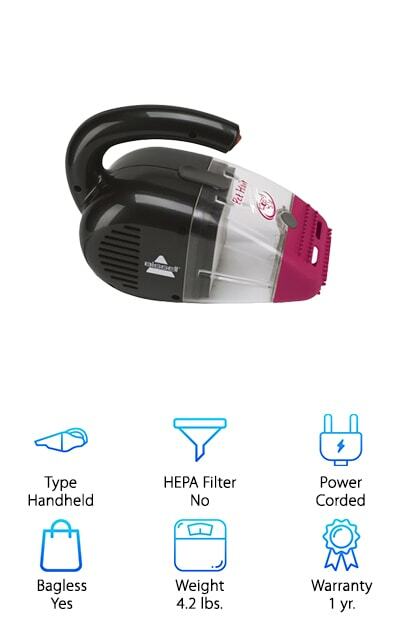 HEPA Filter: Does the vacuum you’re looking at have a filter that will get rid of dust and other debris? We’ll talk about whether it’s going to work well for those who have allergies or any type of asthma. 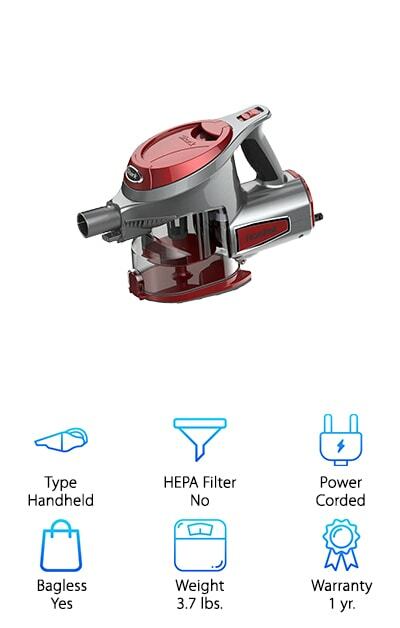 Power: A cordless vacuum cleaner is going to need battery power but has more freedom while a corded vacuum runs as long as you want but needs to be close to a power outlet the entire time you’re using it. Bagless: Some people prefer to have a bag for their stair vacuum while others will prefer to have a bagless system. It’s entirely up to your personal preference which one you like best for these types of vacuums. Weight: If you need to carry around your vacuum (like you will if you take it up a set of stairs) you’ll want it to be somewhat light so the weight of the vacuum is going to be an important feature. Warranty: A good warranty is important because it lets you know more about how the manufacturer feels about the product and its quality. You’ll also be able to look at the length of the warranty to find out more. You’re definitely going to want to get the best stair vacuum you can, right? You don’t want to waste your time with something that isn’t going to work for your situation. That’s why we’ve taken the time to create these stair vacuum reviews, so you can see what the best options are and how they’re going to work for your household. Just take a look and you’ll see which one is going to be your new best stair vacuum for sale. The Shark Rocket Hand Vac is less than 4 pounds, which makes it lightweight and easy to carry around with you. Even better, it has a TruePet Motorized Brush that makes it a whole lot easier to clean by hand. There’s also a dust cup that is easy to empty, meaning you can get back to cleaning or get on with anything else you want. There’s even a 15 foot power cord so you can easily plug it in and go without having to worry about moving the plug as you vacuum. Even when you get close to the end of the space in the tank you’ll still get the same amount of suction as at the beginning. That means you don’t need to worry about the quality of clean you get as you continue to work. It’s the best vacuum for carpeted stairs as well as hard surfaces and has a large tank that will hold approximately one gallon of dust and other debris. It’s just about the best vacuum cleaner for stairs that we’ve found. The Bissell Pet Hair Vacuum is a cheap stair vacuum but it’s a great vacuum cleaner for stairs because it provides a great balance between features and cost. It works on just about any type of material, including upholstery, hard surfaces, carpeting and stairs. It includes multi-layer filtration to help those suffering from allergies, asthma or any other dust related illnesses. There’s even a specialized nozzle that’s able to pull hair and dirt out of different surfaces and another nozzle that works great for anything else that you need. Plus you get a 1 year, limited warranty. When it comes to where you can clean you’ll definitely be happy with the 16 foot power cord because it gives you a whole lot more freedom and capability to get your work done without needing to move the cord itself. At less than 5 pounds total weight, this vacuum has an easy to hold handle that lets you get close in corners and it’s entirely bagless. You just push a button and empty out the canister into your trash. 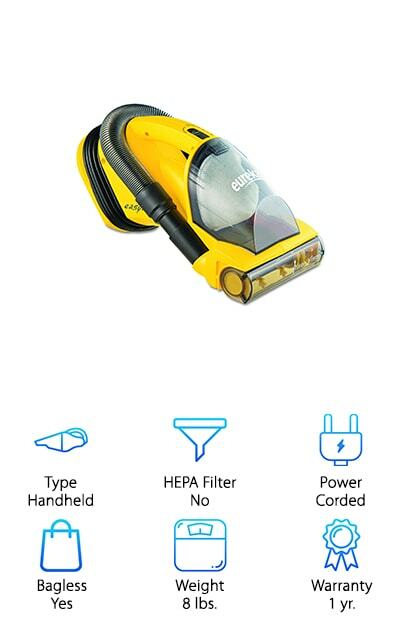 The Eureka EasyClean Vacuum Cleaner is a handheld option that actually comes in two fun colors and is the best vacuum for cleaning stairs. It’s approximately 8 pounds, which makes it easy to carry as needed and definitely to use on your stairs. What’s really great is that it has a 20 foot extension cord, longer than just about anything we know of and has two separate motors, one for the brush and one for suction. That means you’re going to have plenty of power to get the job done, no matter what you’re trying to clean. There’s an integrated filter in the system and it has a simple to empty canister that connects to it in order to get dust out. There’s also a 1 year manufacturer warranty so you know it’s something you can count on. It includes a crevice tool and a riser visor, which lets you get into all the corners and even vacuum up the front and sides of your stairs. The Dyson V6 is a cordless vacuum that’s actually the same height as your standard one (or maybe even a little taller) but it’s definitely a whole lot thinner. 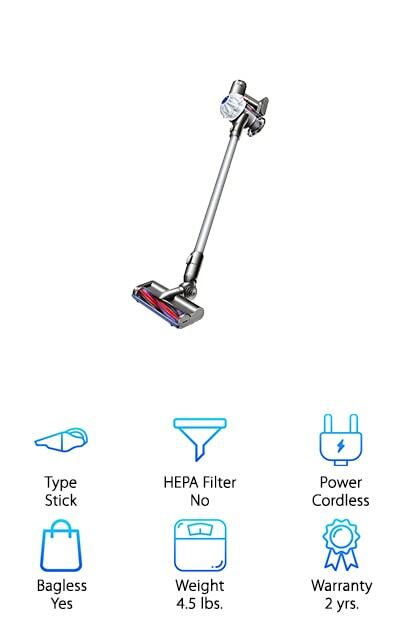 That’s because it’s considered a stick vacuum and it runs entirely on battery power. You’ll get up to 20 minutes of run time out of the system, so you can easily take care of your stairs or even different rooms in your house with no problem at all. There are even nylon bristles and carbon fiber filaments that take care of dirt and dust from hard surface floors and thick carpets. The trigger releases instantly, stopping the battery power whenever you’re not using it. Not only that but it has a handheld mode that makes it even smaller and easier to use in tight spaces, like on your stairs. 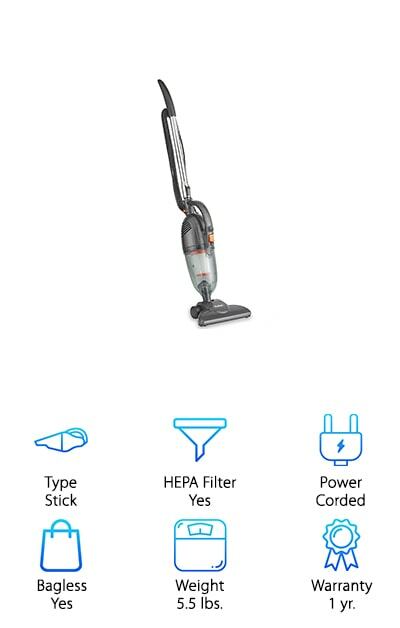 This lightweight vacuum cleaner comes in at less than 5 pounds and uses lithium ion batteries to get the clean you’re looking for. The Bissell Zing Vacuum is actually a full size vacuum that comes in two different colors for your personal preference. It’s a bagless system that offers powerful suction to make sure you get everything off hard surface and carpeted floors. It also has a switch to make sure it goes from one to the other just that quickly. It also has an easy to empty dirt cup, a crevice tool and an automatic cord rewind, which helps you to get into all the nooks and corners of your house. The filters that are included are washable and reusable and the hose length is just over 4 feet long to reach further into corners. The 15 foot power cord length is also effective at letting you get further without having to swap power outlets. At about 11 pounds it’s a little heavier than some of the options here but it also has a larger canister and an adjustable hose that lets you get over your stairs. The Dirt Devil Hand Vacuum offers a high speed brushroll that can get through just about anything, including pieces. There’s also a one touch empty dirt cup that means you don’t have to get your hands dirty while you’re cleaning it out after use. The vacuum itself weighs in at less than 3 pounds, which means it’s going to be a cinch to carry with you anywhere you need to go or to use on the stairs. There’s even a 20 foot power cord with built-in storage so it keeps itself easily contained. 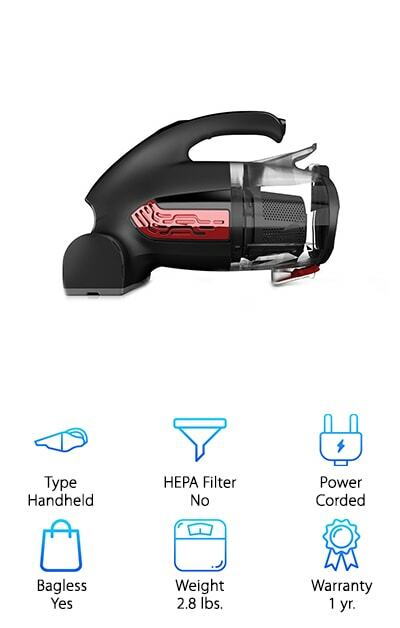 The filters only need a quick rinse to start using them again and there’s a 1 year limited warranty on the vacuum itself. Small enough to get in anywhere, it can clean your stairs quickly and even clean upholstery, hard surfaces and carpeting. It’s also small but still has a large enough canister to keep you going for as long as you need. Finding vacuum cleaners for stairs doesn’t need to be difficult. The VonHaus Vacuum Cleaner here actually comes in 2 different colors to fit your preference, but it’s the other features you’re really going to like. It has a 1.3 liter dust capacity which is stored in a simple container that can be emptied easily into your trash bin. It uses HEPA filtration, which means it gets rid of a lot of smaller particles that are otherwise released by traditional vacuums. Great for hard surfaces, carpets and more, it has a 19.5 foot quick release cord so it can get just about anywhere without having to move the cord frequently. 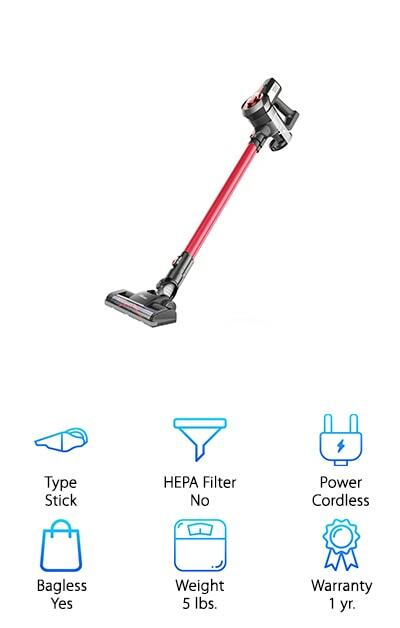 You can use the extension tube to get a more standard size vacuum or you can take it out to have a handheld option that’s much easier to carry up and down the stairs. It’s lightweight, smoother operating and comes with a range of different accessories to make sure you can get into anything. One thing that makes the HoLife Vacuum Cleaner unique is all the colors that it comes in, but that’s just an added bonus. 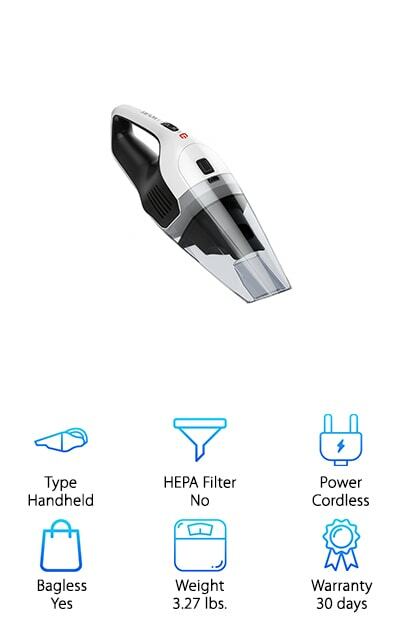 This handheld vacuum is entirely cordless and can run for as long as 30 minutes on a single charge. With super quiet operation, it’s able to clean dust, debris and even liquids with no problem; even pet hair is cleaned up. It works on hard surface floors or on carpets and comes with 2 completely washable filters so you can keep going longer. It can even be back up to full power in as little as 3 hours of charging time. Battery charging is a one step, simple process and the dirt cup is easy to empty and entirely transparent so you can see when it needs it. You’ll also get several accessories that help make cleaning even easier and at less than 4 pounds this is going to be easy to carry up and down the stairs as needed. 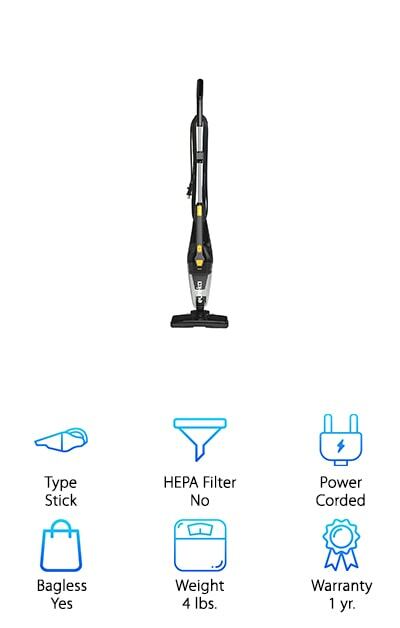 The Eureka Blaze Vacuum Cleaner is designed as a 3-in-1 with a stick form as well as 2 different versions of a handheld vacuum so you can get anywhere you need to. It’s super lightweight, at only 4 pounds, which makes it easier to take on the stairs or even upstairs when you need to. 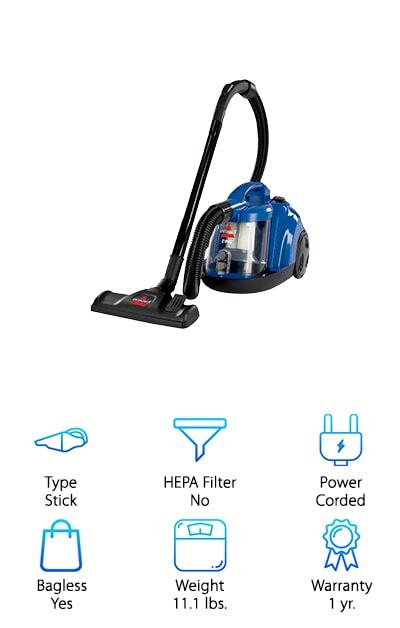 It has a swivel steering design and can pick up large debris with the nozzle but there’s still the 2 amp motor that can get even small particles of dust. The filtration system is washable and the dust cap makes sure that less is getting back into the air. There’s an 18 foot power cord that lets you keep going longer without having to jump to the next power outlet and it works great on hard surface floors or carpet. If you need to get into really tight corners the crevice tool can take care of it. The Dibea C17 is a stick vacuum that provides you with 2 different suction modes for different floor types. It weighs only 5 pounds, so it’s super light for easy movement and it’s the best cordless vacuum for stairs and is entirely bagless. That means you have a whole lot more freedom when it comes to moving around to different parts of your house and when you need to empty it out. No more buying bags all the time. You can even use it as a handheld vacuum instead or use the crevice tool or brush to get into tighter spaces. It’s the best handheld vacuum for stairs. The super quiet system also has an eco-mode that increases your run time to 40 minutes. On standard, you’ll get fade-free power for up to 25 minutes, which is definitely going to help you get the job done. When it’s time to charge you can actually plug it right into its own charging bracket and leave it there for easy storage as well.